Pretty sure you will see why. I can appreciate that! As long as they don't say coyotes over cattle - some guy came down here two years ago and trapped coyotes so now we have an over abundance of rabbits!! Why don't they let that "wolf" in the picture go play, they want to so badly!! Washington Dept. Fish and Wildlife proposed killing off the entire Profanity pack near Kettle Falls. The heat was raised by ranchers who graze cattle on public lands. So federal officers killing federal wolves on federal land for private cattle. Methinks I can understand why it's called Profanity Peak - after a few paragraphs of that article I was definitely at peak profanity! This Trans Pecos area has it's own habitat with bears, cougars, Mexican wolves - and surprisingly they and the cattle get along fine (I can hear the ranchers now!). Oh, we have our fair share of coyotes and upon occasion they get trapped and hunted sometimes for transport, sometimes just for 'sport'. Most of our apex level predators are captured and transported when they 'get in the way'. Michael, I'm sorry that WA can't come up with a better solution than they have. 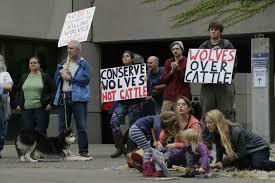 It's really too bad that they can't go out and eliminate the real problem rather than eliminating a wolf pack. This kind of thing always makes me angry. The environment improves with a proper balance of animals. Removing of one species can affect species of animals that have no direct contact with them in all kinds of ways. Just look into the reintroduction of wolves into Yellowstone. It actually helped fish, beavers, birds, and some plant species flourish again in ways that the human's running the place simply couldn't do. They had no idea how the wolves could affect so many other aspects of the parks ecology. To destroy such important, beautiful animals to benefit subsidized ranchers with insured livestock from an occasional loss that doesn't hurt their bottom line is just sad. ^Exactly my feelings. A friend of mine has this on his FB page with a petition to sign. I don't sign many of these, but this one I did. Subject: Re: Save the Wolves! » How to save zucchini seeds? » Lettuce gone to seed?